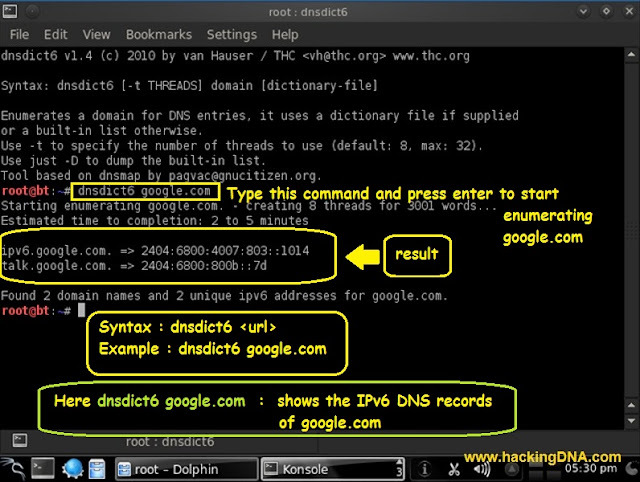 dnsdict6 tool is used to enumerate domain to get the IPv6 address , if it exists. Result : Shown in the above image . Check it . This is how you can use this tool to get the IPv6 address of any url or domain . Thank you for your demonstration. Now, Google and Facebook are using IPv6, i used dnsdict6 to detect the address IPv6 for each one, but the tool doesn't work ! !